Winter has stretched out its arms and settled in. This week’s deep blanket of snow and single digit temperatures sure drew us deeper into the warmth of our homes. This time of year feeds my internal desire to nest. I love layering the furniture with thick, cozy blankets and creating warm, inviting spots to curl up with a good book. I also tend to favor hearty, soul-warming, comfort food over the fresh, light and bright meals of summer. Most of these winter dishes are rich and creamy…warming a body from the inside out. But my one and only problem with them? Many of them call for cream of chicken (or mushroom, etc) soup which are full of fat, calories and unknown chemicals. Melt 2 Tbsp of butter in asaucepan. This week as the mercury dropped, I craved a good crock pot of Chicken and Rice but I wanted to eliminate the canned soup and still have the creamy goodness of the recipe. Thanks to one smart mom of 9 over at Milehimamma.com, I realized I can have all the creaminess of every one of my crock pot and casserole recipes sans the canned soup! Plus, you have the option to vary the flavors depending on what you need (eg. Cream of Mushroom, celery, shrimp, etc). Here is how I did it. Oh, let me warn you about the outrageous time commitment this takes…I timed it and it took me a whopping 6 minutes and 2 seconds. (That included me taking pictures, too!). The benefits of this recipe just keep getting better. Melt 2 Tbsp of butter in a saucepan. Once melted, add 2 Tbsp of flour to the butter. Stir until well combined. The consistency will be thick. Gradually add 1 cup of liquid*. It’s best to add a couple of tablespoons at a time, whisk and add more liquid. Use in any recipe or enjoy a yummy bowl of cream soup! Gradually add 1 cup of liquid andwhisk. This cup of liquid can be a combination of anything. 1 cup of all milk, 1 cup of half milk and half water or what I did was ½ cup of milk and ½ cup of chicken stock (remember my blog about bone broth?). Basically you can make whatever concoction you’d like as long as you’re adding 1 cup of liquid to the flour/butter mixture! If you want to add bits of chicken or shrimp or mushrooms or celery, just dice it well and add it in! It REALLY is that easy. The result is a velvety smooth mixture which smells heavenly. Unlike the “rotten cat food” smell of its commercial counterpart. And while this homemade mixture does get thick it doesn’t ever get that gross, gelatinous, blobbiness that canned soup gets. And let’s not even talk about the sound which it makes coming out of the can! Enjoy a yummy bowl of creamsoup! Don’t ya just hate the gross, gelatinous, blobbiness of cannedsoup? Flour: so cheap, I can’t even do the math! TOTAL: 22 cents for the same amount in the can! Heathlier, cheaper, and tastier!? I am kickin’ the can and switching over to using this recipe for everything! When I added it to my Chicken and Rice dish, it added such a fresh, rich taste. My family gobbled it all up and were looking for more! So during these cold winter days, take comfort in knowing that you are serving your family good, soul-warming food which is healthier, chemical-free, cheaper and much better tasting! Doesn’t that just make you all warm and happy inside?!! 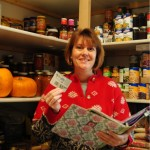 Erin’s got tons of tips for saving money, couponing, sticking to a budget, and living sustainably in her blog archive. And be sure to check out the Missoula Save it Club.